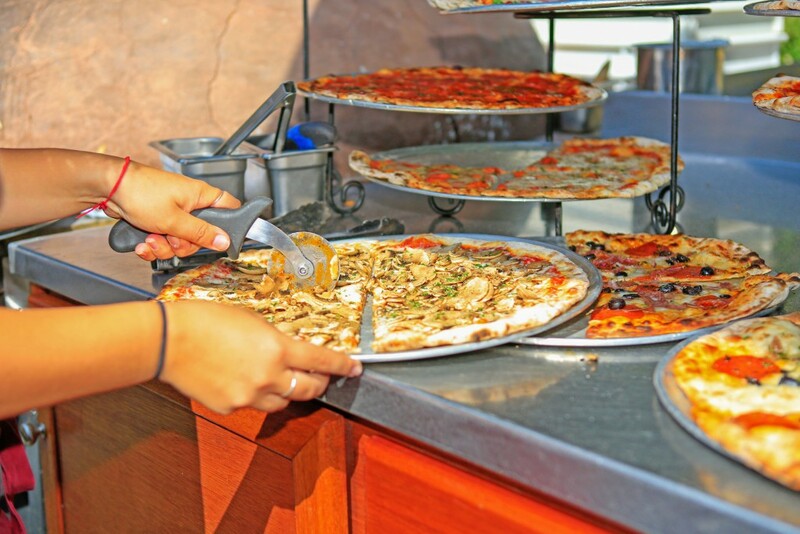 Americans have been enjoying pizza ever since it made its U.S. debut in the early 1900s. Now it’s 2019, and today we’re faced with more difficult choices than ever before. But deciding on what type of pizza to buy should never be a tough decision. Yet we often find ourselves thinking: what kind of pizza should I get next? We’ve all heard the different styles: Chicago deep dish, New York style, stuffed crust, California style, and many more. But what do these names mean, and what makes these pizzas different from each other? California-style pizza originated in Berkeley, California, and is mostly known for its extra thin crust and use of unique toppings. 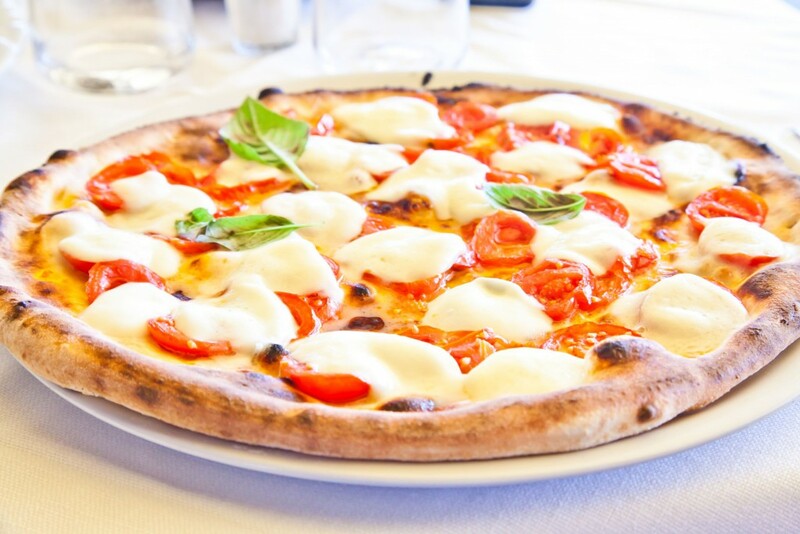 The thin Italian crust often uses olive oil or peanut sauce instead of traditional tomato sauce. Additionally, traditional mozzarella cheese is frequently replaced with goat cheese or a vegan option. California-style pizza is usually topped with the freshest and healthiest ingredients available, usually organic and locally grown vegetables. Some popular toppings include artichoke hearts, avocado, chicken, fish, pepper, basil, and more. To start out, we just wanted to clear the air and answer everyone’s main question: what is ‘Chicago-style’ pizza? It’s simple — it’s a name that’s used to identify which styles of pizza were first developed in the Chicago, Illinois, area. The most popular Chicago-style pizza is Deep Dish, although we’ll also mention Chicago’s Stuffed Pizza and Thin Crust Pizza. Deep Dish is unique for a couple reasons. First, it is baked inside something similar to a cake pan, giving the pizza its abnormally high edge. Second, the inside of the pizza is constructed in reverse from a traditional pizza. Instead of topping the crust with sauce, cheese, and additional items on top, they are made with the cheese bakes on the dough, the other toppings on that, with the sauce on the surface. Even though the pizza is large, the crust is a regular depth. However, because the pizza is so thick, it needs to spend more time in the oven. Constructing the pizza in reverse keeps the cheese and toppings from burning, and adds to the unique experience of Chicago Deep Dish! Besides, who’s going to turn down that much cheese and toppings? The Stuffed Pizza is another child in the Chicago-style family, and is actually quite similar to the Chicago Deep Dish pizza. This pizza was created after two different pizza chains experimented with deep dish pizza by mixing the idea with an Italian Easter Pie from Potenza, Italy, where one of the chefs had immigrated from. 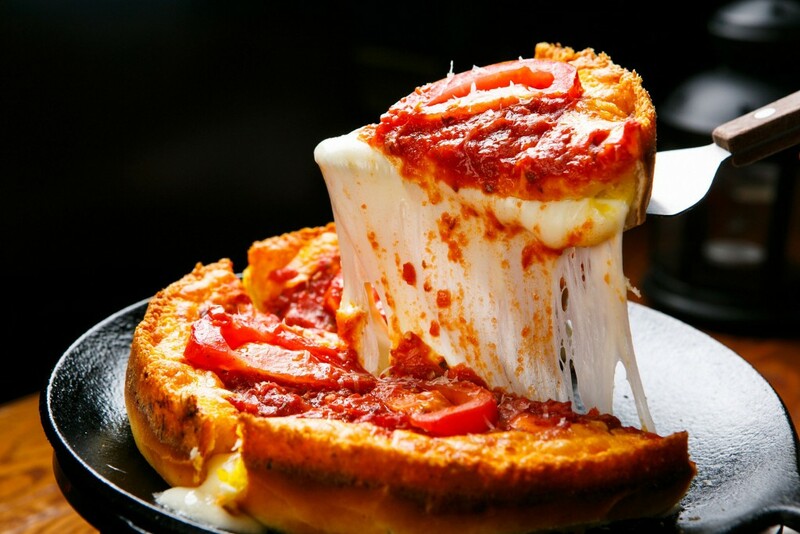 What makes this pizza different is that instead of just being topped with sauce, as a traditional Chicago Deep Dish pizza would be, Stuffed Pizza has an extra layer of crust that is pressed to the sides of the crust, acting as a lid to the pizza. This top layer can give the pizza a domed appearance, so pizza makers often make a small incision at the top of the ‘lid’ to allow steam and air to escape, which keeps the pizza from exploding. 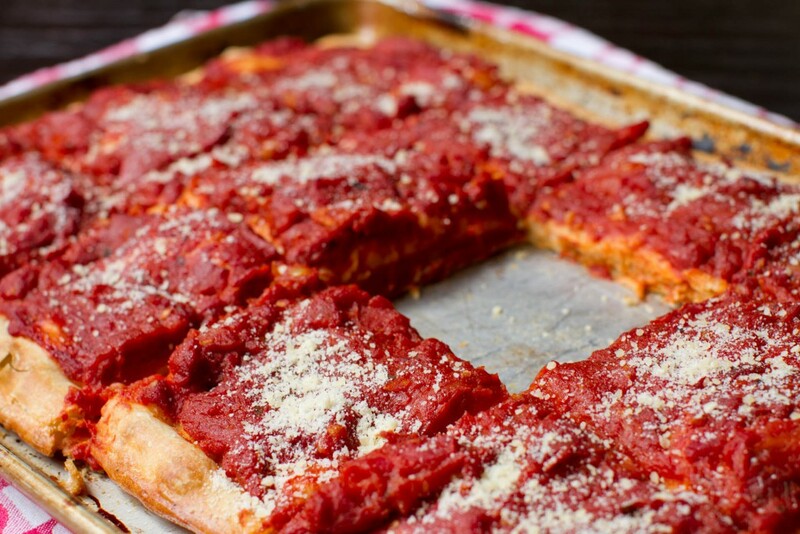 Then, before the pizza is baked, a layer of tomato sauce is spread on top, giving it the traditional Chicago-style pizza look. Chicago Tavern-Style Thin Crust pizza, while equally delicious, is not nearly as famous as the other Chicago pizza styles. 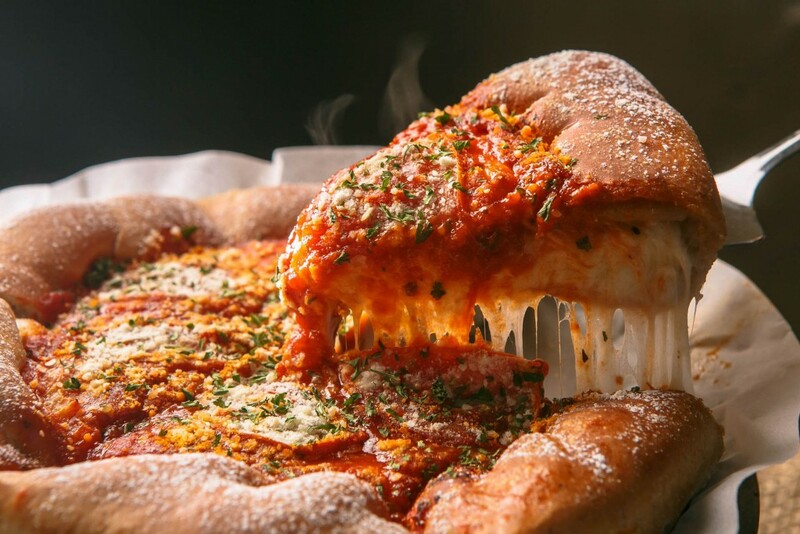 However, strange as it may seem, the Chicago Thin Crust pizza is actually more popular among Chicago natives and other Midwest locals than the other Chicago styles. The Thin Crust pizza from Chicago is characterized by its thin, firm crust, which has a noticeable crunch when bitten into, which is unlike the New York-style, thin-crust pizza. Additionally, the Chicago Thin Crust is cut into squares (tavern style, party cut) when it is served, providing yet another distinction from the classic giant wedge that New York-style pizza is served as. The original Detroit-style pizzas were cooked in rectangular trays that were made to be used in local factories. However, local pizza makers had a something else in mind for them. Originating in Detroit, Michigan, the Detroit-style pizza is characteristically rectangular in shape, instead of being round like most pizzas. It also has a uniquely thick crust that is known for being very crispy on the bottom. Sometimes they double-bake the pizzas to ensure their signature crunchy bite and chewy texture. Detroit-style pizza is another variation of the ‘Deep Dish’ style, although it differs from the more famous ‘Chicago Style’ version. In fact, the popular Little Caesars ‘Deep Deep Dish’ pizza is based on the Detroit-style pizza. This style mostly refers to the style of pizza crust and the way that it’s prepared, not necessarily to the toppings. Greek-style pizza is baked on a pan instead of being baked directly on the bricks of a pizza oven, which is the traditional Italian practice. Prior to baking, the pan is heavily oiled. This causes the crust to be very oily, contributing to its chewy texture. 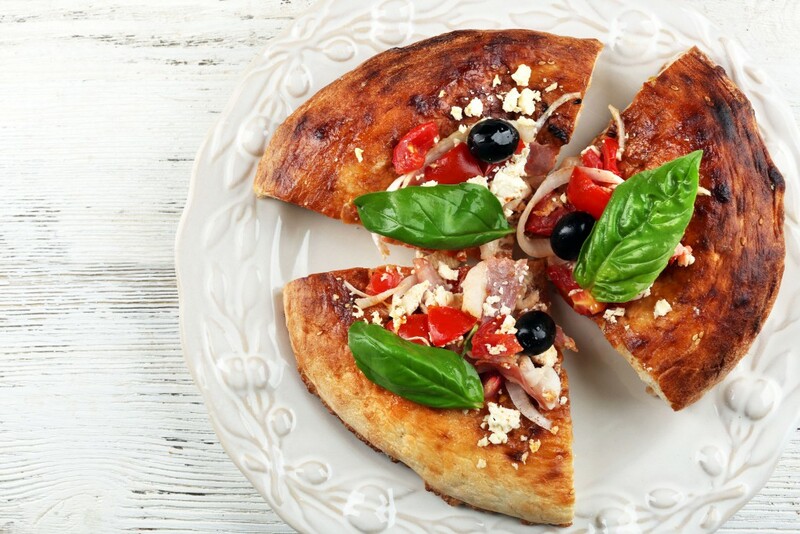 Greek Style pizzas use a very thick sauce with a strong taste of oregano, and while they use more sauce than most pizza styles, they only use a light amount of cheese (usually mozzarella and cheddar). This style of pizza is derived from the pizza that was served in American pizzerias that were owned by Greek immigrants. Neapolitan-style pizza is the first kind of pizza to ever come out of the United States. 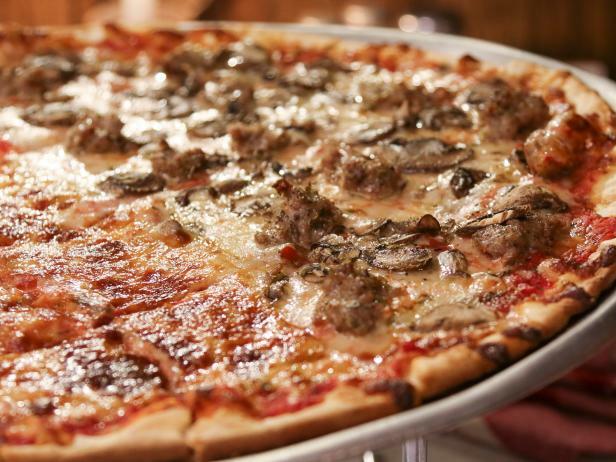 First created by Italian immigrants living in New York City, this pizza is what started it all. Every other style of pizza is, in some way, a variation of this pizza! But other than being the original style of pizza in the United States, what else makes Neapolitan-style special? First, it is completely formed by hand. If there’s a rolling pin used to shape the pizza, it can’t be considered Neapolitan. Also, the crust of a Neapolitan pizza can be no more than 3 millimeters thick. After the crust is made, it is topped with tomatoes and mozzarella cheese. Sometimes there are other toppings added. Once the pizza has been made, it is only cooked for 60 to 90 seconds in a 905° F wood fire oven. 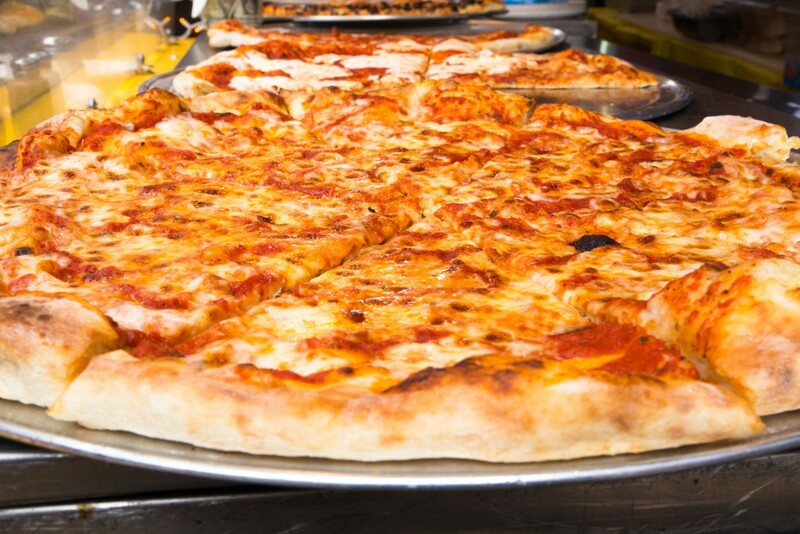 If you’ve ever been to New York City, you’ll know that getting pizza is a must. There’s just something special about trying pizza in the city that debuted such a delicious food in the U.S.
New York-style pizza is special because they are hand-tossed and enormous. They are traditionally served by the slice, so just imagine how huge a whole pizza must be! The crust is thick and crisp, but only along the edge. The rest of it is thin enough to fold in half to eat it, which is the traditional way to eat this kind of pizza. They are also made only with dry, grated mozzarella cheese, which gives it a distinct flavor. These pizzas are extremely popular in New York City and its surrounding areas (New Jersey and Connecticut), and is sold throughout the country. The Quad Cities Area is made up of five cities along the Iowa-Illinois border, including Davenport and Bettendorf, Iowa, and Rock Island, Moline, and East Moline, Illinois. 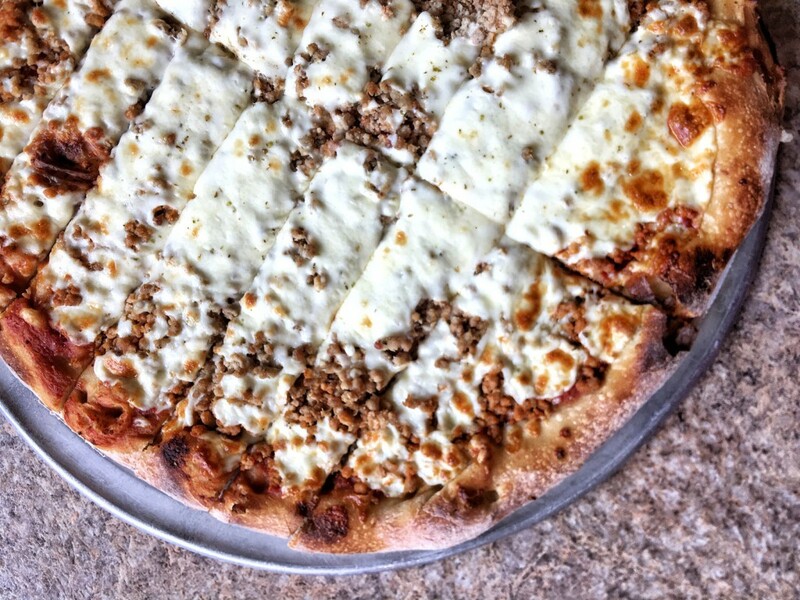 This area is home to the famous Quad-Cities Style Pizza, which features a hand-tossed dough made with malt, a quarter-inch thick crust, and a spicy sauce to top it all off. The pizzas are known for having a nutty flavor because of the use of malt. They’re also known for being spicy because of the use of red chili flakes and ground cayenne in the sauce, along with a layer of Italian sausage and other toppings that are placed beneath the cheese, instead of on top of the pizza. Additionally, once the pizza has been baked, they serve it cut into strips instead of cut into wedges like most pizzas are. This style is another unique variation of pizza that comes from the Midwestern United States, and is primarily from St. Louis, Missouri. St. Louis Style is characterized by a very thin, cracker-like, round crust, which is achieved by making crust without yeast. Additionally, the most authentic St. Louis pizzas will come topped with Provel processed cheese, which is extremely popular in the region. The sauce used on these dishes is unique as well, as it is made with an extreme amount of oregano, giving it a distinct flavor. Once the pizza has been made, with the crust, sauce, and toppings as they should be, it is ready to be served. However, instead of cutting it into wedges as most pizzas are, St. Louis pizzas are cut into squares. This style of pizza is so special, it’s almost impossible to get it anywhere outside of the immediate area surrounding New Haven, Connecticut. These pizzas typically have a crust, oregano, and tomato sauce, with only a little bit of cheese on top. However, the cheese on top is never mozzarella. In the case of these pizzas, mozzarella is considered to be a topping. If you want it, you’ll have to ask for it. Otherwise, your pizza won’t have any mozzarella on it. Another distinct feature of the Tomato Pie is its thin, charred crust. This is accomplished by baking the pizza in a coal-fired oven at over 650° F! They are sometimes even served with fresh littleneck clams on top. We’ve all enjoyed a nice bite of stuffed crust and tasted the delicious melty mozzarella cheese that goes with it. 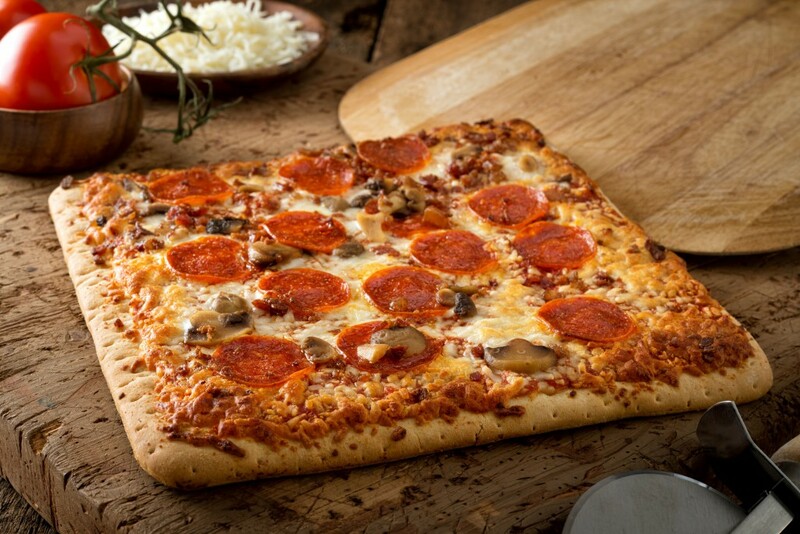 Stuffed crust has probably been around for a while, but believe it or not, it was actually popularized in the 1990s by Pizza Hut! Since then, Pizza Hut has ventured into uncharted territory by stuffing their crusts with various other foods. In 2012, they released a hot dog stuffed pizza crust in the United States. Other variations include a marmite stuffed pizza in New Zealand, seafood stuffed pizza in Japan, fish egg stuffed pizza in Hong Kong, Fish n’ chips stuffed crust in England, and miniature meat pie stuffed pizza in Australia. An incredible popular variation on the traditional pizza, the Calzone is an Italian, oven-baked, folded pizza. Calzones are traditionally stuffed with various meats, vegetables, and cheeses, which all go to make calzones an extremely flavorful experience. To make a calzone, just use regular pizza dough to form a medium-sized disk. Then, fill each disk with the desired cheese and fillings, fold it in half, and seal it with an egg mixture in a half-moon shape before baking. Sometimes, calzones are even deep fried! When fried, they become a new kind of food called a panzerotti, or a ponza for short. Calzones are often served in regular pizza restaurants, or you can try making your own. No Comments to "The Ultimate Guide to Pizza Styles"